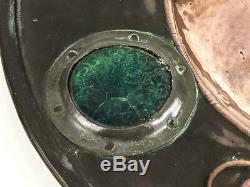 C1890 Art Nouveau Copper Dish with Green Enamel Bosses. 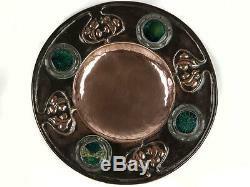 An attractive and decorative hand made Art Nouveau or British Arts & Crafts copper dish, decorated with repoussé embossed pomegranates and riveted bosses, made of green enamel glaze. The dish has a wide rim with a shallow bowl. The bowl and the highlights of the pomegranates are polished, whilst the rest has a dark oxidised finish. 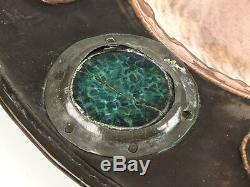 The enamel glaze discs are a marbled sea green and are held in place by pewter flanges, which are riveted on to the copper. 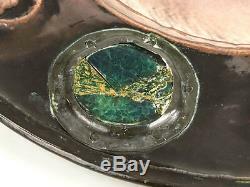 One of the enamel bosses is cracked quite badly and another has a slight crack. This does not detract from the iconic beauty of the piece. There are no maker's marks. Size: 29.5 x 1.5 cm (11 1/2 x 5/8 inches) Weight: 655 g. Have a look at our other items. If you have any questions we are more than happy to help. _gsrx_vers_804 GS 7.0.8 (804). 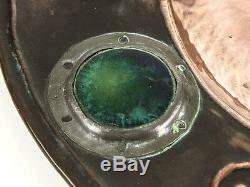 The item "C1890 Art Nouveau Copper Dish with Green Enamel Bosses" is in sale since Friday, July 8, 2016. 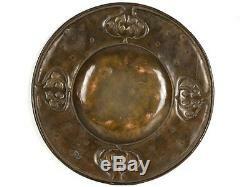 This item is in the category "Antiques\Metalware\Copper".